Ronald Hansen was born on June 23, 1910 in Virginia, Minnesota, where his father was a railroad station agent. When a lad of seven or eights, Ronald was walking along the railroad tracks and came upon two occupants of the famous hobo village, who were busily engaged in making glass ships from pop bottles which had been severed length-wise. These men, who were using a charcoal fire and a bellows combined with their simple tools and creative skill to fashion the glass ships, were judged by Mr. Hansen to have been immigrants from Bohemia or Czechoslovakia. Hansen credits this experience as his first insight to creative glasswork. During the twenty years that Mr.Hansen lived in Virginia, Minnesota, and including two years in college, he could not definitely determine which creative artistic venture he would follow—glassblowing or writing poetry. 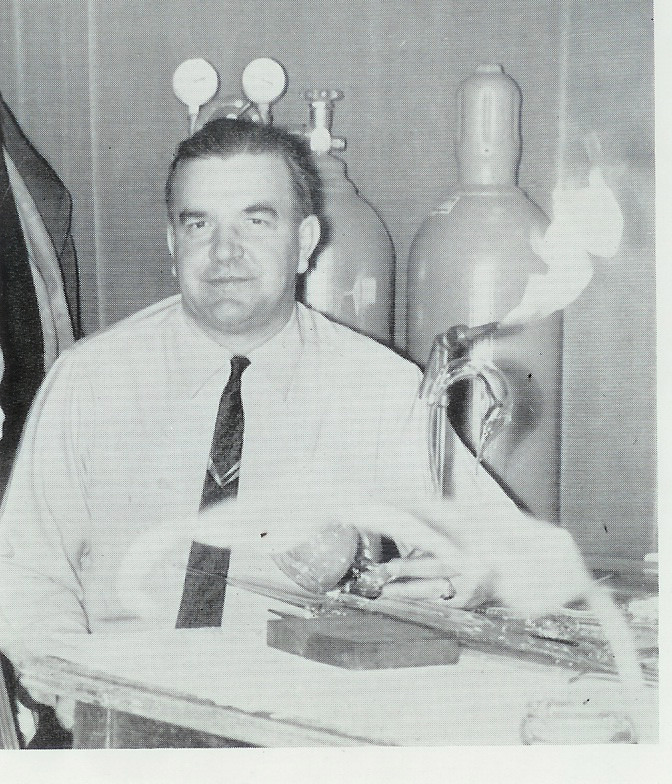 Working in his shop in Mackinaw City, Michigan, using a glass rod 1 ½ inches in diameter and lamps, Mr.Hansen created a wide variety of weight designs in many colors. The flower, the snake, the animal, or perhaps a fluted spiral was in turn encased in brilliant crystal. He was thorough in his research for quality materials, and like other weight artisans, decried the lack of quality colorants and crystals. The use of good materials requires a large investment of money. When added to this are the investment in skill and the cost of weights which are broken or destroyed because they do not please the weight maker (sometimes as high as twenty-eight out of thirty weights), then the collector may more readily appreciate why he pays the price he does for a Hansen weight.